Leeds Beckett University Building Services Engineering students would like to invite you to attend their annual research conference, to be held at the University on Thursday 15th December 2016. Each student will be presenting a research paper, on a topic of their own choosing, in part fulfilment of their final year degree award. Topics this year include: LED lighting applications, heat pumps, daylight analysis, natural ventilation & air quality, PV solar applications and building control strategies. The event will comprise 10 minute student presentations, followed by Q & A sessions, and is expected to last for no more than 3 hours. You are cordially invited to join our students for liquid refreshments immediately following their presentations! Join us for a new half-day seminar which presents an overview of the underlying principles of thermal bridging. The seminar will introduce thermal modelling of bespoke construction details and offer guidance on how to read and effectively utilise thermal bridging calculations to improve detailing. Following on from Matthew, a break out session from Tom Dollard of Pollard Thomas Edwards will ask delegates to sketch over a number of part L accredited details, and improve the details for thermal performance. Best practice guidance will be examined. To finish up, Tom will present the Zero Carbon Hub Builders Book, and pick out key details and issues relevant for delivering thermal performance. Both trainers are keen to answer queries you may have, with two Q&A sessions forming part of this seminar. 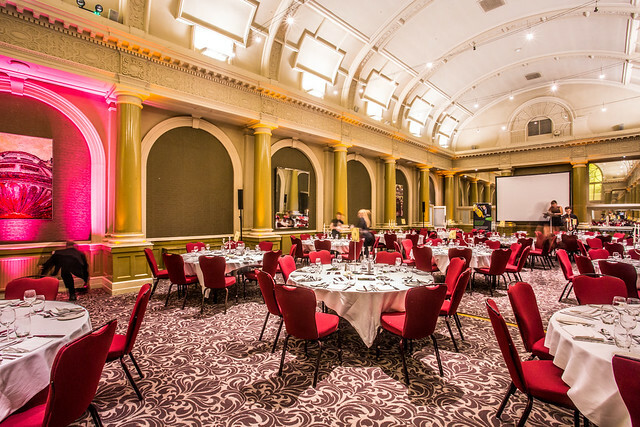 Over 100 industry, academic and third sector professionals gathered at the Met Hotel in Leeds for the annual celebration of the talented companies, groups and individuals who are changing the nature of the built environment industry through extensive research, development and innovation. The Research, Innovation, Sustainability and Enterprise (RISE) awards, organised by Centre for Knowledge Exchange on behalf of the Leeds Sustainability Institute (LSI) at Leeds Beckett, were established in 2015 as a means of bringing together disparate groups, celebrating new thinking, initiatives and technologies and providing a unique platform to foster productive collaborations going forward. Presented by Gaynor Barnes from ITV Calendar and sponsored by Knauf Insulation, 18 awards were handed out in total across 16 different categories including field and laboratory research, sustainable developments, social value, enterprise, and education and training. In a change from the standard application form, entrants for these awards were encouraged to use their creativity and create a visual poster outlining their initiative. Winners on the night came from a vast array of environments, specialisms and backgrounds each displaying the passion and dedication to do things better, pushing the construction industry forward and driving up standards. Winners included SES Engineering Services and Atkins Global for the Sustainable Development – Non Domestic and New Technologies categories respectively and Yeme Architects who took the Heritage trophy for their Manningham Baths development. They were particularly praised for attention to the social benefits of the product and for bringing one of Bradford’s best-loved buildings back to life. Ryedale Flood Research Group were the night’s only double winner, taking home the Vision and Sustainability trophy and the special Chair’s Award, presented by Professor Chris Gorse from the Leeds Sustainability Institute. 2015 winners Arc Building also continued their success in these awards, walking away with the product and element interface prize; as did last year’s sustainable development winner, CITU who triumphed in design and innovation for their recently launched Climate Innovation District project in Leeds. The CIOB-sponsored the New Technology prize was won by East Riding of Yorkshire Council. The LSI also handed out two awards in honour of respected Leeds Beckett colleague, Dr Andrew Platten, who passed away in July. Andrew was an original founder of Leeds Beckett’s thinkBIM network and a strong advocate of Building Information Modelling (BIM) as a collaborative tool for the future and therefore it was fitting that the trophies for BIM training and BIM adoption were awarded in his name. Andrew’s son, Adam Platten, was welcomed to the ceremony alongside his family, to present the two awards which went to coBuilder International for BIM adoption and the NBS for BIM training. Software company, Trimble Tekla, completed the trio of BIM awards, winning the education and training award for their Tekla Campus project. The awards were a grand finale to Leeds Sustainability Institute’s International Sustainable Ecological Engineering Design (SEEDS) conference held on the Wednesday and Thursday of that week at the Rose Bowl in Leeds. This international conference explored how buildings and spaces are designed to reduce negative impacts on the environment, with keynote speakers, workshops and presentations focusing on how to address the balance between the built and the natural environment. The awards ceremony also raised £575 for Yorkshire Cancer Centre thanks to the generous donations from the attendees. If you are interested in being involved in RISE 2017 (sponsoring, entering or assisting) please contact Liz Schofield on 0113 812 1902 or via email to e.a.schofield@leedsbeckett.ac.uk . We look forward to hearing from you! Now that the dust has settled on #ceyh2016 we want to thank you all for contributing to making it such a great night and for all of the incredible entries to the competition. Our judges had a tough, but enjoyable time reviewing, discussing and agreeing which projects stood out just that bit more than the others. This year’s judging has been the most difficult yet and with many excellent projects already underway in our region at the moment we know that #ceyh2017 will be even harder! We also wanted to let you know about our friends at CIBSE Yorkshire who are running their own awards for the first time this year. They are keen to raise the profile of building services within the region and celebrate the whole team that contributes to the amazing schemes which are being delivered throughout the country by companies based in the region. If you would like to know more about it visit www.cibseyorkshire.org/CIBSE-Yorkshire-Awards—2016.aspx while their Chairman, Simon Owen is more than happy to talk with you directly about how you can get involved. His contact number is 07971 695 625 or you can email him on simon.owen@calibresearch.co.uk. Simon and the rest of the committee are all volunteers, so they are organising the event alongside their “day jobs”. With their closing date being the 22nd July, you have chance to get your entry in and benefit from momentum that you have gained with your partners at our own awards and be ready to be recognised on the 18th November at their ceremony at the Royal Armouries. It’s high time we celebrated the diversity that is the building services profession as well as recognising the vital contribution that this part of the supply chain makes to the finished project .Therefore we encourage you to support CIBSE Yorkshire in leading the way with the first regional focussed building services awards away from London and get those entries in today! LEEDS Beckett are proud to sponsor the inaugural CIBSE awards which recognises the importance of full supply chain involvement. The Leeds Sustainability Institute at Leeds Beckett University is now accepting applications for an October 2016 start on its successful part-time professional doctorate (D.Eng) programme. This is aimed at professional practitioners who wish to undertake a programme of research related to their own field of expertise. Applications in the fields of sustainable buildings, green computing or energy are particularly encouraged, but projects in all areas of sustainability can be considered. The building, energy and sustainability research group within the Leeds Sustainability Institute has a wide and innovative research portfolio working with major public sector and industry partners. This is an opportunity to contribute to exciting and industry leading projects working alongside the existing team. The work will involve creating and analysing building energy performance models and analysis of quantitative and qualitative data from the field in occupied and unoccupied buildings. The role focuses on modelling and quantitative analysis of buildings and on undertaking forensic investigations energy useage and occupant behaviour. The successful application will collaborate on a number of research projects involving data acquisition and statistical analysis. You will be working within the LSI alongside a team of researchers. – Awarded (or in the final stages of obtaining) a PhD (or equivalent experience) in buildings, data analytics, physics or an energy related discipline. – A strong understanding of appropriate quantitative and qualitative research methods, with an aptitude to learn and develop further modelling skills. – A proven track record of publication. – Propose, design, and conduct quantitative research, while advising research teams on the application of analytical methods. – Communicate project progress and author reports in collaboration with the team. – Contribute towards a new grant application to continue the collaboration. To apply visit the Leeds Beckett University jobs page, search for the above job and follow the instructions on screen. Please note that this job description and employee specification will no longer be available after the closing date so please download or print now! Leeds Beckett University values the diversity of its workforce and student population and welcomes applications from all sections of the community.? We particularly welcome applications from black and minoritised ethnic candidates as these groups are currently under-represented at our University.